In this seasonably blistery weather we're having, it's always nice to turn up the heat by cooking or better yet, baking something fresh and delicious. There's nothing like the smell of a homemade pie or a crusty bread (in this case challah) to go along with that hot tea or chocolate you're already sippin' on. Although I consider my mom to be more of a cook than a baker, she's really good at making breads. I thought her beautiful round challah pictured above deserved a big shout-out and some encouragement to you that it's not as hard as it looks. Inspired to make this challah from an episode of Martha Stewart we both watched together, this beautiful bread was made by a local baker, Diane Margaritis from Roslyn, NY who owns a fantastic bakery and restaurant called Diane's. Introduced to this bakery by a friend, I was impressed at the quality of sweet and savory goods, everything made with classic French techniques and resembling something you'd find in a quaint boulangerie in Paris. The main differentiation in Diane's challah is the use of wholesome ingredients such as buckwheat honey (which you can find in any local supermarket) and wheat germ. Since challah is a sweet bread, sugar is used, by my mom noted Diane's recipe calls for a bit too much for her liking so she almost halved the quantity suggested. You may want to do the same if you're striving for something semi-sweet. Looking at my mom's creation makes me want to make my own and invite some friends over to try it. Hope you do the same and enjoy a cozy winter evening at home. Thank you for this shout-out, dear Fooditka. 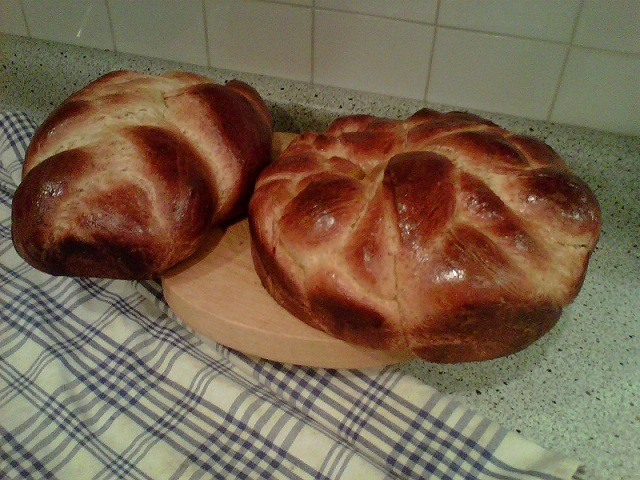 Making Challah is fun, however be aware that it requires plenty of time.